Sega Rally 3 is sequel to one of the most successful arcade racing series ever made. 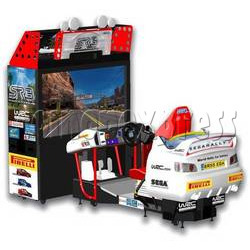 Machine with high Definition Graphics from the most powerful arcade game board - Europa-R and new cabinet design, it is fantastic motion simulation that gives you the feeling of being on a real rally stage. Nice and unique track deformation, never the same race twice. Player can join championship mode, quick race mode and classic mode. The cabinets are said to be sporting 62-inch monitors and scaled-down models of cars (for seating) with motion technology in the base. The game features include link play for up to six players, the original Sega Rally '95™s desert track, three challenging environments and a championship mode. Nothing really new by the sound of it, but still exciting, nevertheless, to have another true arcade Sega Rally. One of the biggest complaints against the recent Sega Rally Revo on the Xbox 360 and Ps3 was that the game had lost the "arcade feeling" and had become more of a challenge to learn, which went against the usual pickup-and-play experience players were used to with the first two games.